(Due to MadWorld‘s extremely violent content, reader discretion is advised, but just remember that it’s all in good fun.) You may remember from my glowing review of Infinite Space that I am seriously in love with Atsushi Inaba and Hideki Kamiya’s fabled studios, Clover and Platinum. And, since The Wonderful 101 is finally hitting Wii Us across America, I thought it’d be a good time to take a second look at the studio’s debut title, which hit the Wii four years ago. Between 2008 and 2009, after a slew of games that included Super Mario Galaxy, No More Heroes and Super Smash Bros. Brawl, there was a fairly massive dry spell on the Wii as far as new games were concerned. 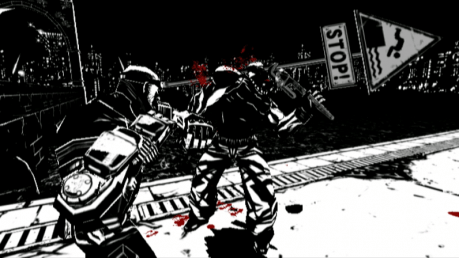 All of these descriptors are indeed well-deserved, but, in spite of (and not because of) its preoccupation with violence, MadWorld is one of the Wii’s best games for the 17-and-over crowd. That’s because Platinum made a fun, stylish brawler with crazy enemies, great boss fights and lots of demented tongue-in-cheek humor. And it’s on the Wii. Well, it did have a notoriously delayed and underrated spiritual sequel on the 360 and PS3 by the name of Anarchy Reigns, but that’s beside the point for now. 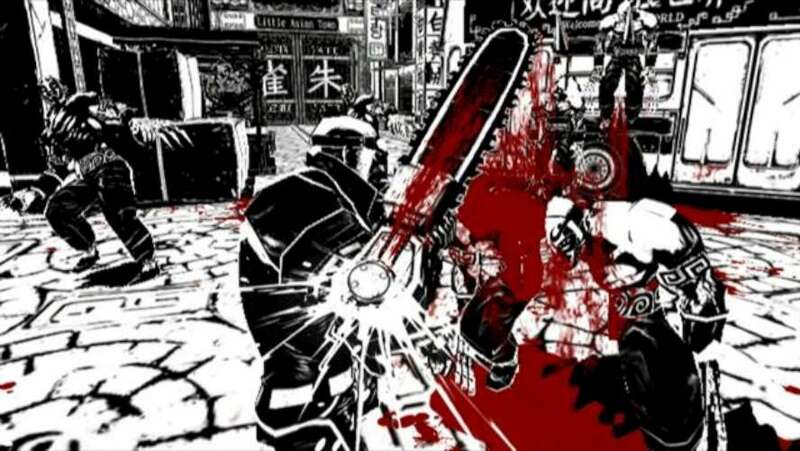 And, while it has some similarities to the aforementioned No More Heroes, which I also absolutely love, MadWorld is most definitely its own beast. For doing stuff like this, I assume. Jack gets a mysterious call by a man who calls himself “Agent XIII,” and, next thing he knows, he’s thrust into Death Watch alongside a bunch of terrorists, killers and other freaks. He’s rank 256, but he has to get to 1 in order to win fame and fortune. Little do Jack and “Agent XIII” know that ulterior motives are at play in this game show. Naturally, the story takes cues from Battle Royale and The Running Man, and steps aside to showcase the gory action, but I thought it was actually a genuinely enticing little yarn with a couple of unexpected plot twists for good measure. The writing is altogether sophomoric and hilarious, just like the rest of the game. 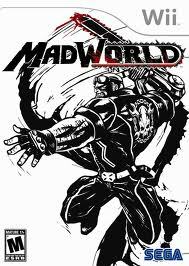 One thing that really sets MadWorld apart from its contemporaries is its style. With this game, Platinum took advantage of the Wii hardware’s relatively low-tech specs and created something quite new. 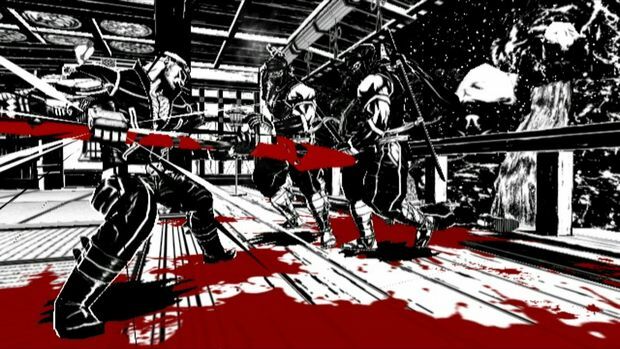 As one can tell from the screenshots, this game goes by the same “black, white and red” mantra expressed in some Frank Miller graphic novels, with the occasional yellow for emphasis of titles, comic-book sound effects and maps. 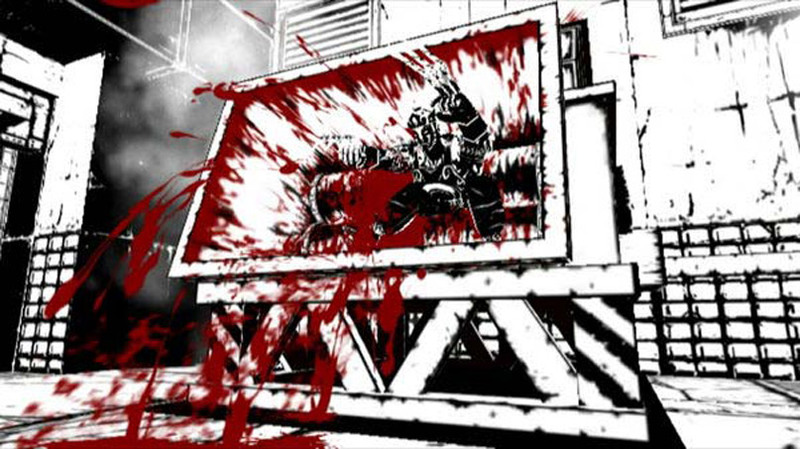 True, a few fully colorized games have more excessive violence than MadWorld, but the gratuitous blood splashes and ludicrous gibs really pop out in this game’s black-and-white world. Some might call it too sadistic for its own good. I personally think it’s not only aesthetically pleasing, but also a prime example of games as art, all because of its sheer style accompanied by some cool texturing. And you know who doesn’t consider this game art? Those ninjas right there. As for MadWorld‘s sound, there are two aspects in particular that especially stand out. The music is a fantastic mix of hard rock and rap, with beats laid down by Platinum’s in-house composer, Naoto Tanaka, and songs featuring the underground rappers Ox, Douljah Raze, Sick YG, Bandy Leggz, Wordsmith and Optimus, as well as the group S.O.U.L. Purpose. While occasionally repetitive, these songs definitely make good music to kill by, and some in particular, such as Sick YG’s “Ain’t That Funny” (which you can check out in the video below), definitely have good lyrics and the same earworm quality one can find on some more conventional game soundtracks. Previous Post:Vote-to-Localize Number One Fan Contest—Thanks to Those Who Entered!